Our 3rd annual salmon film festival was the best yet! We moved the time and the place: November 8-10, 2013 (Veteran’s Day weekend), in the Ft. Bragg Portuguese Hall (822 Stewart Street), a lovely historical building where the best local fish feeds take place. We welcome you to check out the 2013 FILM LIST..we ended up with almost 40 films! Our festival runs 365 days/year!! Most films are available to screen online, for those lucky folks with broadband internet – to make it easy, we’ve provided direct weblinks. We encourage you to share the festival online with your friends! 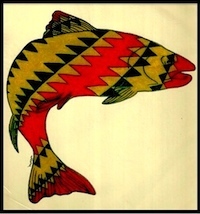 Do you have a T-Shirt (XL) with the above salmon graphic by Johnny Clay? We did once…see the Salmon Restoration Association website.